Washington: Powdered medical gloves used by doctors have been banned for use in the US after they were found to be “very dangerous” for a variety of reasons. The ruling marks only the second time in history that the US Food and Drug Administration (FDA) has banned a medical device. The first time was when it prohibited the use of prosthetic hair fibres 1983. The agency first proposed the ban in March this year. The ban will take effect on January 19 next year. “While medical gloves play a significant role in protecting patients, health care providers and other individuals in close proximity, powdered gloves are very dangerous for a variety of reasons,” the FDA said. The powder is sometimes added to gloves to make them easier to take on and off. However, if the powder on latex gloves becomes airborne, it can cause allergic reactions, the agency said. The FDA said that use of the gloves on patients has been associated with wound inflammation, as well as a condition in which bands of scar tissue form between people’s organs after surgery, ‘Live Science’ reported. Today’s state-of-the-art medical gloves include non-powdered alternatives that provide all the benefits of powdered gloves, without the same risks, the agency said. The FDA determined that simply adding a warning label to powdered gloves was not enough to address the risk, the agency said. The ban was first proposed by the FDA in the month of March 2016. Powder is sometimes added to gloves to help make it easier to put them on and take them off; however, powdered gloves are dangerous for a variety of reasons. In particular, aerosolized glove powder on natural rubber latex gloves, but not on synthetic powdered gloves, can carry proteins that may cause respiratory allergic reactions. Although powdered synthetic gloves do not present the risk of allergic reactions, these devices are associated with an extensive list of potentially serious adverse events, including severe airway inflammation, wound inflammation, and post-surgical adhesions, which are bands of fibrous scar tissue that form between internal organs and tissues. 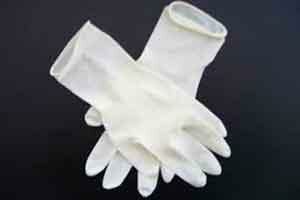 These side effects have been attributed to the use of glove powder with all types of gloves.